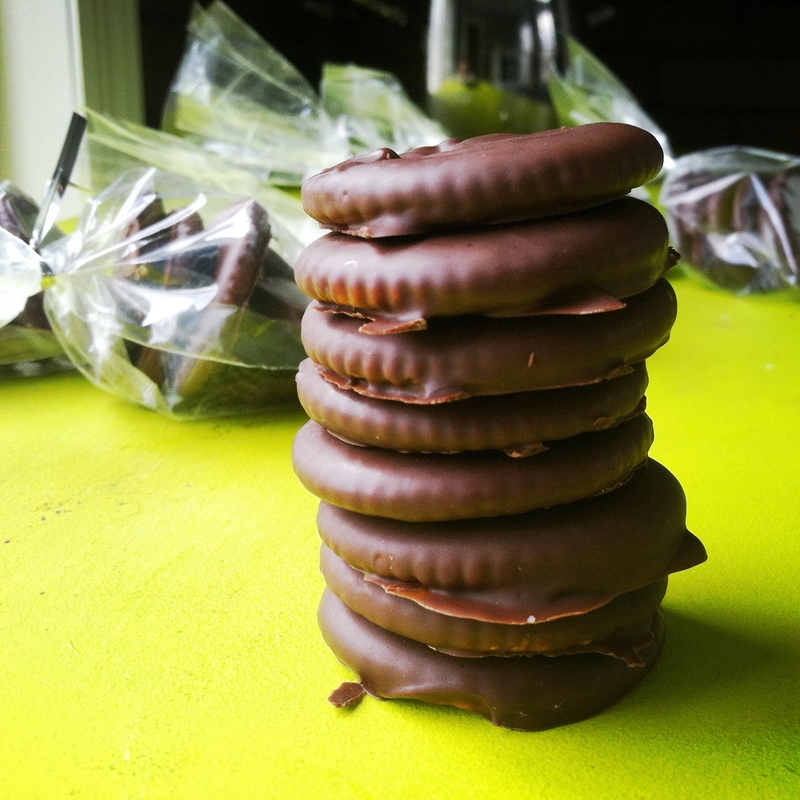 Easy Vegan Thin Mints. | Eat More Plants. I found this recipe on loveveggiesandyoga.com. It couldn’t be simpler to make these; you only need four easily found ingredients. And no baking! Who knew ritz crackers were vegan? Aren’t they always bragging about their “rich, buttery taste”? Hmm….interesting. Thin mints were never my favorite girl scout cookie. I tended to go for the samoas or the dosidos but in my 20’s I’ve developed and love for the mint and chocolate combo. Make sure you have room for a few cookie sheets to fit in your fridge/ freezer ahead of time. In a microwave safe bowl melt the chocolate and shortening. Shortening is something I NEVER cook with but it’s necessary to use here as a stabilizer for the chocolate. It prevents the melted chocolate from hardening too quickly and keeps it smooth. This was actually the first time I ever bought shortening lol. Be careful not to burn the chocolate. Start with 30 seconds and give it a stir to see how melted it is. Go for 15 second intervals after that until you reach a smooth consistency. Add your peppermint extract and stir in. Now put 1 cracker at a time into the chocolate, flip it to coat completely and scoop it up with a fork so that the excess chocolate will drip down through the tines. Place each coated cracker on a baking sheet covered in wax or parchment paper and place in your fridge or freezer to harden. I let these cool for an hour and then bagged them and put them in my garage, where it’s about 30 degrees. I plan on giving them to my family and friends for Christmas. They are the perfect combination of mint, chocolate and crunch! Love them. Glad you loved my recipe! Thanks for trying it!